For Newman, university is a place of transition from boyhood to adulthood and therefore entails responsibilities for the maturing individual, as well as greater freedom. While providing an emancipatory experience, college life brings with it the baggage of rituals, disciplinary restrictions, spatial constraints, domestic requirements, academic duties, a daily timetable, and shared living, all of which serve a formative purpose. There was a time when religious or charitable organisations saw the provision of student accommodation and oversight as a mission worth undertaking and a service worth providing; but nowadays attention is directed at welfare activities which are deemed to be more deserving: the collapse is both one of supply and of demand. Concern about suitable residential conditions is not on the agenda for most students or parents; few bother to consider which arrangements might be most conducive to human flourishing, let alone where they might be found. In Britain there is a dearth of chaplaincies and university residences along Newman’s lines – and the absence is barely noticed. Newman would have drawn attention to this, and argued that there is a need for discipline and training in that art of virtuous living which has been handed down through the generations in order for civilisation to be nourished, renewed and passed on as an integral whole. 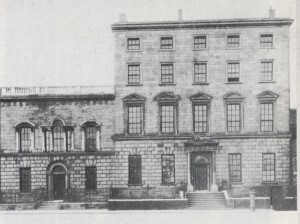 The question of domicile goes to the very heart of what Newman sought to establish in Dublin: a university that was capable of providing each student with a deep formation, precisely because it was residential. Initially there were three types of students attending the Catholic University: interns, externs, and auditors. The latter were non-matriculated students who merely attended lectures and so did not come under the jurisdiction of the university. The externs were supposed to attach themselves to a collegiate house and put themselves under the dean of the house, while their home or their lodging was regarded ‘as an integral part of the academical domicile; so that the young men so situated are as simply under the jurisdiction of the Dean as if they resided under his roof’. The plan only met with partial success, as few of the students had tutors, so Newman altered arrangements for the start of the fourth academic year. In the new system, the externs would either become non-resident students or else ‘quasi interns’. The latter were those who sleeping and taking their meals at home should be accounted interns so long as they were ‘bonâ fide present in some Collegiate House during the business hours of the day, say from 9 till 3’, effectively placing themselves under its jurisdiction for that period of time; they would also be provided with tuition. To ensure that there was still a bonus on residence, and to prevent the administration of the University falling into the hands of those who had never resided there and were ignorant of its traditions, Newman proposed that degrees taken by non-residents, though bona fide and to the outside world possessing all the advantages of a degree, were little more than honorary within the University. In other words, they did not qualify the person for holding office at the University, as would a degree gained after residence. Though it might seem that Newman was obsessed with the notion of ‘jurisdiction’ and laying himself open to the charge of attempting to apply a legal concept to a setting where it was inappropriate, his preoccupation was more than a legal quibble. Legally, indeed, he was on strong ground, for most of the students were minors (majority was then twenty-one years), and the University was therefore legally in loco parentis. But more importantly, Newman held strongly that the University undertook a grave responsibility of oversight for those who entered its doors; it acted on behalf of parents in its attentiveness to growth in virtue; it was ‘an Alma Mater, knowing her children one by one, not a foundry, or a mint, or a treadmill’. For someone with such an elevated understanding of the role of the university, it was not a matter of indifference whether jurisdiction could be exercised or not. This also explains why Newman had originally entertained the idea of the University and its collegiate houses being configured as a (personal) diocese. Newman envisaged lodging houses which would hold up to twenty students each, presided over by a dean, each with its own private chapel and a chaplain, one or two lecturers, and resident tutors. ‘Thus there would be some sort of governing body in each house, or what would ultimately become such.’ If possible, each residence would also have two or three scholars, who would act as ‘a sort of medium between the governing body and the independent [i.e. ordinary] students’. When a student was admitted to the University, he ‘is at once put under discipline, and he is required to join himself to some particular House or Community, of which he becomes a member’. Each house was under the rule of a dean, assisted by a number of tutors, each had its own chapel and common table, and each a working-day timetable that ran approximately as follows: Mass at 8 am, followed by breakfast; attendance at lectures from 9 am to l or 2 pm; dinner at 5 pm; and the students’ presence indoors by a fixed hour in the evening, which varied according to the time of year. What about students who expected to live at home or with friends of the family? Newman’s idea was that the dean of a collegiate house would be the governor or the president of the house, ‘with jurisdiction over all persons in it, with responsible care of the young men in intellectual as well as moral respects, with the duty of seeing that they have sufficient private tuition’, and with a seat on the University Senate. Newman refers to the pastoral responsibilities of the dean when speaking of the college as ‘a place of residence for the University student, who would then find himself under the guidance and instruction of Superiors and tutors, bound to attend to his personal interests, moral and intellectual’. (Rise and progress of universities) All this he describes at length in rousing images of security and sanctuary. It was laid down that all those residing in the collegiate houses should receive ‘spiritual direction’, usually from the dean or chaplain of the house, and that they should go to confession regularly with one or the other of them. At St Mary’s, the students seem to have gone to Newman (the dean of St Mary’s) for confession, though they were free to choose another confessor. Each collegiate house had its own chapel and Mass was celebrated there each day. Newman had the knack of breathing life into tutorials. From the testimony of his pupils we know that he challenged each of them to think for himself, to understand what he was reading, and to articulate his ideas; to compare and contrast, to challenge and contradict, to reduce an argument to its simplest form, to test it against historical examples, to recast it in his own words or in a different style, and to make comparisons with the present day. At one and the same time tutors needed to be kindly to their charges and understanding, while remaining firm, demanding and unyielding. ‘Beware of repenting indeed of idleness in the evening, but waking next morning thoughtless and careless about it’, Newman wrote to one of his tutees in 1827. Ideally the tutors would be young men, not more than two or three years older than their pupils, who had recently finished their own course of studies at the University and gained honours in their exams, or else were (or had recently been) holders of scholarships. As at Oxford the ‘real working men were, not the Professors, but the Tutors’; they ‘will be the real strength of the institution’. Being ‘young men who go through the drudgery of preparing the students for examination, and see that they profit by the Professors’ Lectures’, the tutors needed to live alongside their pupils. ‘They will have nothing to do with discipline, but be as much as possible the friends of their charge. They will not be responsible for their conduct, but for their intellectual proficiency’. Newman expected them ‘to gain the confidence and intimacy of the young men – and, in this way, to smooth the Dean’s work’, hence the insistence that they ought to have nothing to do with discipline, ‘for else, good bye to the confidence I speak of’. Newman’s idea of the tutor’s role touches on much that makes him special as an educational thinker – and much that is characteristic of him as a person: his recognition of the importance of education for the development of young people; his love of his fellow human beings; his caritas; his stress on the formative value of personal influence; his appreciation for the personal element in the process of understanding and embracing knowledge and faith; his patience with human weakness in the fitful process of maturation; his grasp of the obligations and rewards of the universal; his insistence on the practical. In particular, Newman held that moral and religious truths were best communicated and most likely to stir the heart by the power of personal influence, and that tutorials should be conducted on this basis. These views were not the outcome of research or reading, but rather the result of many years in education, during which he had tried to live out his high ideals and to observe critically and ponder on what he saw around him. Ideally, Newman hoped that each collegiate house at the Catholic University would have a residential tutor, who by being on the spot could more easily care for and supervise the students in their studies and moral development; by associating more with them, he would have greater opportunity of forming the minds and manners of his pupils, and thereby would give more assistance and moral support to the head of house. Charles de la Pasture, one of Newman tutees in Dublin, recalled, ‘I learnt more as to the writing of Latin from a few classes given privately to the men of his own house by Newman as its tutor than I did from a longer course’ of lectures under the two professors of Latin, Robert Ornsby and James Stewart. He added, ‘to read the Greek tragedians in the same manner with Newman was, indeed, a classical treat I love to recall’.